The Roman Forum is one of Rome's most important attractions. But it is a jumble of marble fragments, triumphal arches, temple ruins, and sundry other ancient architectural elements from various time periods. This run-down of some of the Forum's most important attractions runs from east to west, beginning at the Colosseum. See this map of the Roman Forum to get an idea of the layout of the ruins. Arch of Constantine - This massive triumphal arch sits on the Piazza del Colosseo right outside of the ancient amphitheater. The arch was dedicated to Constantine in 315 A.D. to commemorate his victory over co-emperor Maxentius at the Milvian Bridge in 312 A.D. Via Sacra - Many of the Forum's buildings are laid out along the Via Sacra, the ancient triumphal "sacred" road. Temple of Venus and Rome - Rome's largest temple, dedicated to the goddesses of Venus and Rome, was built by Emperor Hadrian in 135 A.D. It sits on a high hill near the entrance of the Forum and is inaccessible to tourists. The best views of the temple ruins are from inside the Colosseum. Arch of Titus - Built in 82 A.D. to commemorate Titus's victory over Jerusalem in 70 A.D., the arch contains depictions of the spoils of Rome's conquest, including a menorah and altar. The arch also was restored in 1821 by Giuseppe Valadier; Valadier included an inscription detailing this restoration as well as darker travertine marble to differentiate between the ancient and modern parts of the arch. Basilica of Maxentius - The once-gigantic basilica is mostly a shell, of which only the northern aisle remains. Emperor Maxentius began the construction of the basilica, but it was Constantine who saw the basilica's completion. Thus, this building is also known as the Basilica of Constantine. Here is where the giant statue of Constantine, now in the Capitoline Museums, initially stood. The huge exterior of the basilica forms part of a wall running along the Via dei Fori Imperiali. On it are maps showing the expansion of the Roman Empire. Temple of Vesta - A small shrine to the goddess Vesta, constructed in the 4th century AD and partially restored in the early 20th century. Inside the shrine was an everlasting flame to the goddess of the hearth, Vesta, and it was tended by the Vestal Virgins who lived next door. House of the Vestal Virgins - This space contains the remains of the house of the priestesses who tended to the flame in the Temple of Vesta. Surrounding a couple of rectangular ponds are approximately one dozen statues, many of them headless, which depict some of the high priestesses of the Vestal cult. Temple of Castor and Pollux - The twin sons of the god Jupiter were worshiped from a temple in this spot from the 5th century B.C. The ruins which remain today date from 6 A.D.
Temple of Julius Caesar - A few ruins remain of this temple, which was built by Augustus to commemorate the spot where his Great Uncle's body was cremated. Basilica Julia - Some stairs, columns, and pedestals remain from Julius Caesar's great basilica, which was built to house law documents. Basilica Aemiia - This building sits just inside one of the Forum entrances, at the intersection of Via dei Fori Imperiali and Largo Romolo e Remo. The Basilica was built in 179 B.C. and was used for money lending and as a meeting place for politicians and tax collectors. 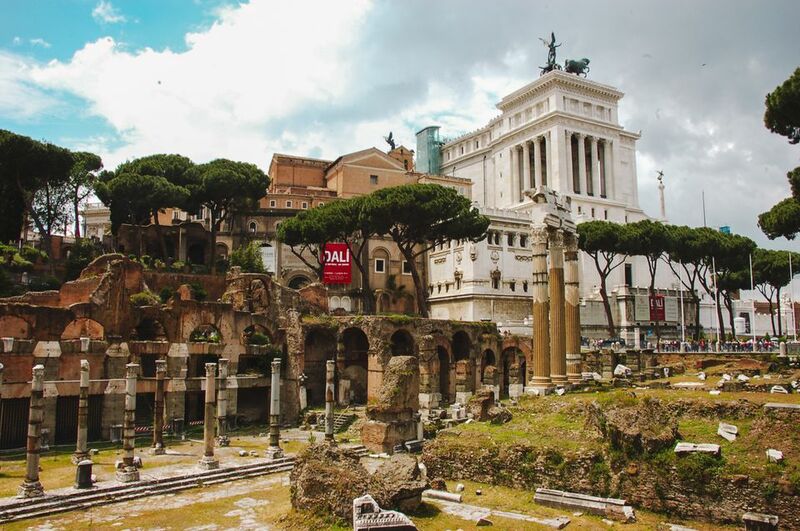 It was razed by the Ostrogoths during the Sack of Rome in 410 A.D.
Curia - Rome's Senators met in the Curia, one of the earliest buildings constructed in the Forum. The original Curia was destroyed and rebuilt several times, and the one standing today is a replica of one built by Domitian in the 3rd century A.D.
Rostra - Mark Antony made the speech that began "Friends, Romans, Countrymen" from this ancient dais after Julius Caesar's assassination in 44 B.C. Arch of Septimius Severus - This striking triumphal arch at the western end of the Forum was built in 203 A.D.
to commemorate Emperor Septimius Severus's 10 years in power. Column of Phocas - Erected in 608 A.D. in honor of the Byzantine Emperor Phocas, this single column is one of the last monuments to be placed in the Roman Forum.